For the past three decades, if you wanted a website domain name, you went out and bought one. Now, years of servicing that cyber-land rush has whittled your possible .com options down to the wildly esoteric (drunkgerbils.com is available), weird intentional misspellings (how about c0mputerz.com?) or phrases so long no one will ever find you (how come there’s no traffic to heres-where-i-sell-my-stuff.com?). The internet is a lot like the universe. It’s constantly expanding in all directions. 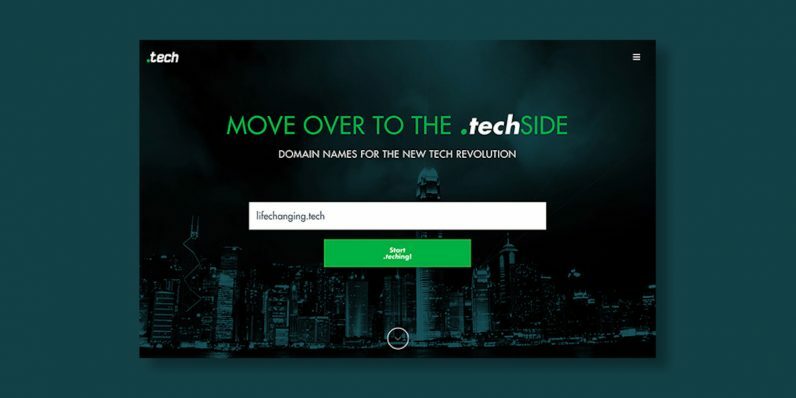 That expansion has opened up a host of new URL options, including the super-hot .tech domain. Right now, you can stake out one year subscription of your own .tech real estate for only $4.99, five year subscription for $29.99, or ten year subscription for $54.99 from TNW Deals. For any site with content or a business linked to technology, you can not only craft a URL more catered to you and your services, but land a better spot from a much wider field of possible domains. That’s why organizations like Microsoft (rewards.tech), Intel (Intel.tech) the Consumer Electronics Show (ces.tech), and even us here at TNW (tnw.tech) got on board. Or if you’ve already got your prime .com location, pick up a few redirects from your corresponding .tech address as well. Retaining a website domain usually costs about $50 a year, but getting in on the limited time deal for a 1-year ($4.99), 5-year ($29.99) or even a 10-year ($54.99) .tech domain.